Andrew Salter has signed his first professional contract with Glamorgan on the back of breaking into the Welsh county's first team this season. The 19-year-old all-rounder from Haverfordwest has represented England Under-19s and also appeared for Wales Minor Counties and Cardiff MCCU. 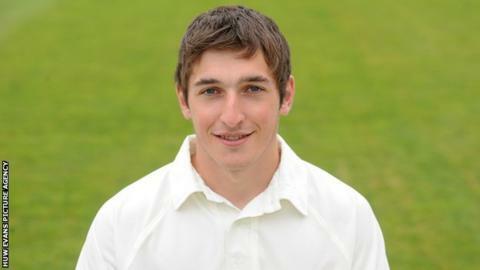 Salter, who adds useful off-spin to his batting, made his debut in Glamorgan's Clydesdale Bank 40 campaign in August. The youngster played against Durham and then also faced Nottinghamshire. Salter says he has taken inspiration from fellow off-spinner Robert Croft, the Glamorgan and former England player, who may consider retiring after this season. "Crofty is a legend, he's always been a massive role model to me," Salter said. "He's bowled brilliantly when he's bowled this year, taking wickets in Swansea I think he took his 50th fiver [five-wicket haul], so he's still bowling well. "Naturally watching him as a kid you always try and replicate how they bowl, but I'd like to think I've got my own technique and I'm my own sort of player - but obviously he's been a massive role model growing up."